ALPHA reader: Fan Letter Blog Crawl: Dear Stacia Kane . . . 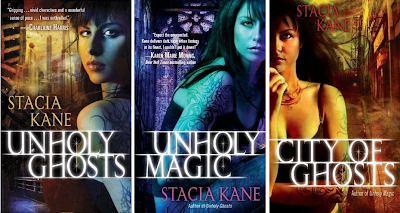 Fan Letter Blog Crawl: Dear Stacia Kane . . . I didn’t stumble across you. You weren’t a diamond in the ruff or a reading happenstance. The truth is you and Chess Putnam were creating a furor. There was a buzz in the blogosphere, GoodReads loved you and Amazon recommended you. Even people I know who are strict Biographical/Historical/Crime readers were telling me to give this Stacia Kane chick a read. So I did. And I didn’t get it. Your book was fast. There were ghosts attacking and jive-speaking thugs swapping drugs to a church-going heroine. 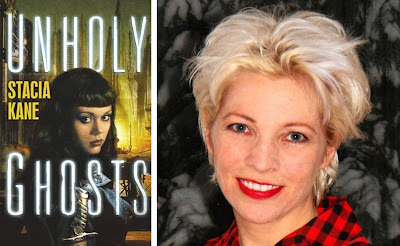 Truth be told, ‘Unholy Ghosts’ had me stumped. I didn’t know what all the hype was about; I could barely decode the dialogue let alone get excited about these supposedly ‘brilliant’ books. So I threw in the towel after a couple of chapters. I put the book down and walked away. I almost gave up, Ms Kane. But the buzz kept buzzing and I eventually gave up and gave in. I decided to valiantly soldier on and read more. And I can tell you exactly when you hooked me for good and forever. Terrible reached forward and turned up the radio. The Misfits blared from the speakers, singing about skulls. It somehow suited the moment. That moment changed everything for me. Chess’s antagonism was palpable, and Terrible was conjured as a Neanderthal-looking Elvis impersonator. But something just clicked. I couldn’t even put my finger on it at the time – but from that moment in I was engrossed. Chess was unlike any heroine I had ever read. Between her addiction to Cepts, her duel church-working/drug-taking personality and the different faces she showed to the world – Tulip to Lex, Chessiebomb to Terrible – without showing anyone her real core, fucked-up self. I had always claimed to revel in the ambiguous and prefer characters made up of dubious shades of gray. But that was a lie. Until ‘Downside’ I had never really read an anti-hero I liked. I had always read waiting for redemption, and my liking came with a price – the assumption that the author would turn the character around and make them inherently good. Cesaria Putnam is different. I like her now, just the way she is. I like the fact that she’s scared of everyone finding her out and realizing the extent of her addiction. I like that she doesn’t let anyone close, because history tells her it can only lead to hurt. Heck, I even like that she’s out for herself and nobody else. I like her because she’s flawed, recklessly so. Chess is an addict who doesn’t know how to help herself . . . and I like her, regardless of her flaws (not because of them). I like Chess because I know that reading her path to some semblance of redemption will be hard. It won’t come with the love of a good man (heck, her beaus are thugs and muscle-men). It won’t come with some light-bulb-moment acceptance of a past trauma (she was abused as a child, that’s the truth not an excuse). It won’t come easily, this amalgamation of a happily-ever-after. Chess will have to fight for it, and fight herself for it. You will, undoubtedly, make readers work for it too, and I am fully prepared to grit my teeth and shed tears. I know all this because you, Ms Kane, write tough. You write raw, gritty, messed-up characters living imperfect lives between a rock and a hard place. You write in-your-face and dangerous. You have given readers an anti-heroine to care about. You’ve paired her with thugs and bad-guys and given her as many self-imposed hurdles as external ones. There’s no yardstick for her redemption, and there’s no happily-ever-after on the horizon. But there’s just something there, beneath the surface and on the tip of my tongue. It’s like in that car with Chess and Terrible – when there was open hostility with a current of something hot running below the snide remarks. It’s there in Chess fighting the ghosts and bringing Terrible back from the dead. It’s Chess admitting she’s scared shitless, but loving Terrible anyway. It’s the fact that Chess is fucked-up beyond belief, but I love her and so do plenty of other people. Because, despite it all, she’s one cool chickie who has a lot of people (and readers) in her corner, even if she doesn’t know why she’s worth backing. Everything about your series is gloriously unique, off-center and bold. Your genre is a mish-mash of urban fantasy/rockabilly. Your characters speak in jive to reveal their station in life. Your heroine is a hot mess and your love interest is fairly fugly. And I can’t believe I nearly missed out on all the fun just because I was too impatient to appreciate it. My bad. Because your series has fast become an all-time favorite, and I am counting down the months until March 27th 2012 when Chess’s story continues in ‘Sacrificial Magic’. . . because, damn Mama!, you rocked my reading world, ya dig? Hear hear! you said it all and so perfectly! Amazing letter and I completely agree with it all!! I felt the exact same way from book 1! Danielle - that is one fantastic letter. I love how you initially tried the series, but yet went back and had it...click :) Not sure if it's quite me, but I think I know someone who might like it, so I'm sending her the link to you letter. Chess must be the most f'ed up heroine I ever read, but I can't help but like her. She and Terrible make a great team. True dat. Never a truer statement said.... Love your personal journey starting the series and so pleased the series made your keeper shelf..
LOL - I love your letter. I feel the same about most of it, except I see it just a smidge differently. See, I KNOW people like Chess, and have lived a kind of rough life - not as rough as some, but rough enough. I've had friends that have been or are going through the same issues - minus the whole ghost/magic/possible demon thing. What I love about this series is that the main character is shown as being human, yes - being one hot mess and still she's a person with feelings, fears, dreams (though she probably wouldn't admit that-most people in circumstances like that DON'T admit to having dreams) and all the other feelings that go with being alive. Ms Kane forces people to see that with her characters in the Downside series. They aren't angels, but they're all capable of doing heroic things. Just like perfectly good people are all capable of doing a dark deed (or thinking about it) so are all the "rough, messed up hot messes" capable of doing good deeds. They may never ever become "perfect" citizens, but they are people, who are doing the best they can with what they have, and with what they were given or inflicted with. That's what I enjoy about this series. Reading an excellent story about a type of person who would normally be cast as a villain or a fool at best. And Ms Kane does such good job of it. I'm not even looking for redemption for Chess or Terrible, or Lex. I'm enjoying the story and hoping for the best ending for them...or the best new beginning, whatever that brings. and enjoying each new tale that Kane brings to us with those characters. I've yet to read this series but it really hits all the highnotes in your letter. I LOVE fucked up heroes and protagonists and a drug-taking female main makes me get giddy with excitement. I've heard the buzz around this author but never been convinced to pick her up before. I'll just have to now. Thank you! Your letter was just wonderful! I totally agree. It takes a little bit of a push to get into this series, but soon into the first book you are hooked. It is so unique you can't help but be intrigued. Stacia is a brilliant writer! I loved how you describe your journey to loving Ms. Kane's work! Thank you so much for sharing! You have a wonderful blog.